This artist's map of the Milky Way shows the location of one of the farthest known exoplanets, lying 13,000 light-years away. Most of the thousands of exoplanets discovered to date are closer to our solar system, as indicated by the pink/orange areas. The discovery demonstrates that Spitzer -- from its unique perch in space -- can be used to help solve the puzzle of how planets are distributed throughout our flat, spiral-shaped Milky Way galaxy. Are they concentrated heavily in its central hub, or more evenly spread throughout its suburbs? "We don't know if planets are more common in our galaxy's central bulge or the disk of the galaxy, which is why these observations are so important," said Jennifer Yee of the Harvard-Smithsonian Center for Astrophysics, Cambridge, Massachusetts, and a NASA Sagan fellow. Yee is the lead author of one of three new studies that appeared recently in the Astrophysical Journal describing a collaboration between astronomers using Spitzer and the Polish Optical Gravitational Lensing Experiment, or OGLE. OGLE's Warsaw Telescope at the Las Campanas Observatory in Chile scans the skies for planets using a method called microlensing. A microlensing event occurs when one star happens to pass in front of another, and its gravity acts as a lens to magnify and brighten the more distant star's light. If that foreground star happens to have a planet in orbit around it, the planet might cause a blip in the magnification. Astronomers are using these blips to find and characterize planets tens of thousands of light-years away in the central bulge of our galaxy, where star crossings are more common. Our sun is located in the suburbs of the galaxy, about two-thirds of the way out from the center. The microlensing technique as a whole has yielded about 30 planet discoveries so far, with the farthest residing about 25,000 light-years away. 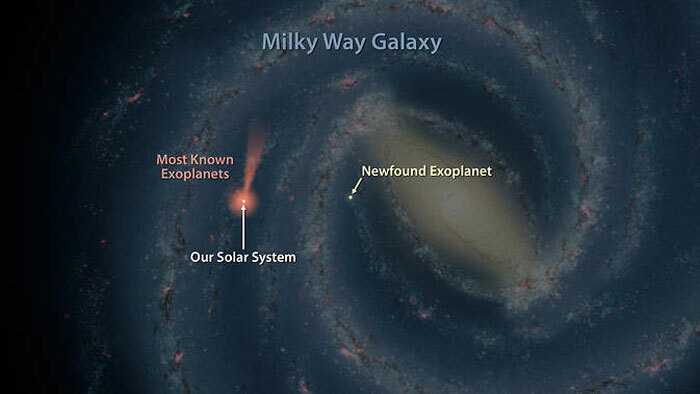 "Microlensing experiments are already detecting planets from the solar neighborhood to almost the center of the Milky Way," said co-author Andrew Gould of The Ohio State University, Columbus. "And so they can, in principle, tell us the relative efficiency of planet formation across this huge expanse of our galaxy." Microlensing complements other planet-hunting tools, such as NASA's Kepler mission, which has found more than 1,000 planets closer to home. But it faces one key problem: This method can't always precisely narrow down the distance to the stars and planets being observed. While a passing star may magnify the light of a more distant star, it rarely can be seen itself, making the task of measuring how far away it is challenging. Of the approximately 30 planets discovered with microlensing so far, roughly half cannot be pinned down to a precise location. The result is like a planetary treasure map lacking in X's. That's where Spitzer can help out, thanks to its remote Earth-trailing orbit. Spitzer circles our sun, and is currently about 128 million miles (207 million kilometers) away from Earth. That's father from Earth than Earth is from our sun. When Spitzer watches a microlensing event simultaneously with a telescope on Earth, it sees the star brighten at a different time, due to the large distance between the two telescopes and their unique vantage points. This technique is generally referred to as parallax. "Spitzer is the first space telescope to make a microlens parallax measurement for a planet," said Yee. "Traditional parallax techniques that employ ground-based telescopes are not as effective at such great distances." Using space telescopes to observe microlensing events is tricky. Ground telescopes send out alerts to the astronomy community when an event starts, but the activity can quickly fade, lasting on average about 40 days. The Spitzer team has scrambled to start microlensing campaigns as soon as three days after receiving an alert. In the case of the newfound planet, the duration of the microlensing event happened to be unusually long, about 150 days. Both Spitzer and OGLE's telescopes detected the telltale planetary blip in the magnification, with Spitzer seeing it 20 days earlier. This time delay between viewing of the event by OGLE and Spitzer was used to calculate the distance to the star and its planet. Knowing the distance allowed the scientists also to determine the mass of the planet, which is about half that of Jupiter. 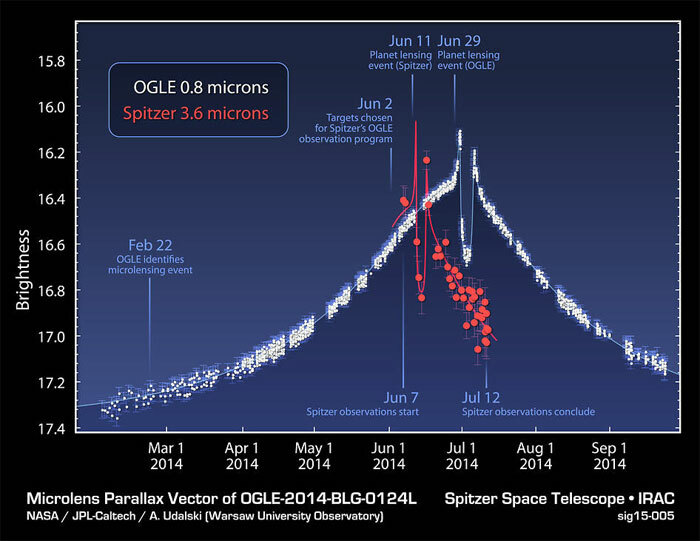 Spitzer has eyed 22 other microlensing events in collaboration with OGLE and several other ground-based telescopes. While these observations have not turned up new planets, the data are essential to learning the population statistics of stars and planets at the heart of our galaxy. Spitzer will watch approximately 120 additional microlensing events this summer. "We've mainly explored our own solar neighborhood so far," said Sebastiano Calchi Novati, a Visiting Sagan Fellow at NASA's Exoplanet Science Institute at the California Institute of Technology, Pasadena. "Now we can use these single lenses to do statistics on planets as a whole and learn about their distribution in the galaxy." If the foreground star is circled by a planet, the planet’s gravity can alter the magnification over a shorter period, seen in the plot in the form of spikes and a dip. The great distance between Spitzer, in space, and OGLE, on the ground, meant that Spitzer saw this particular microlensing event before OGLE. The offset in the timing can be used to measure the distance to the planet. 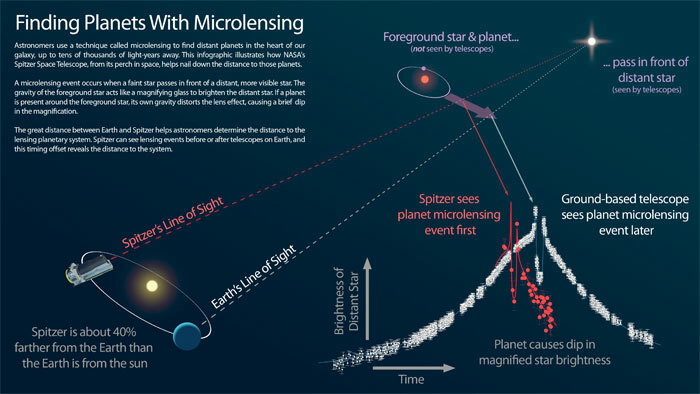 The finding was the result of fortuitous timing because Spitzer's overall program to observe microlensing events was only just starting up in the week before the planet's effects were visible from Spitzer’s vantage point.